Being a children’s entertainer in Melbourne is a rewarding experience in itself. There is no greater satisfaction than seeing the kids having and enjoying a good time and being jolly little bags of fun as they really are. And you being the one who brings them the much needed laughter and joy, this feeling itself is immensely satisfying and rewarding. Also it’s a two way street and it goes both ways. You might think that you are the one who is showing them a good time and giving them a dose fun and enjoyment, but in actuality they are rewarding you by just being with you and light up life, even if for a brief moment, by their magical presence. Friendly personality and good sense of humor is a must. Patience is a must. Dealing with kids requires a lot of patience. And I mean a LOT. Children when exited can become silly, goofy and naughty as well, in order to successfully handle them you have to have patience. You must be energetic and enthusiastic to bring the performance to life. You have to be imaginative and adaptive as one has to perform in front of an audience of range of age groups. If you are in search of a quality children’s entertainer in Melbourne who has all these qualities and more, then search no more. 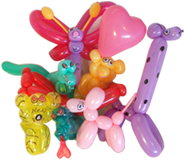 Go for Balloonatic Bruce as he is a professional in the truest sense and entertainer like no other.